Can I have multiple cameras under one account? - Frequently Asked - Alfred Center | get the most out of the best home security app! Can I have multiple cameras under one account? Yes you can! Alfred supports an unlimited number of Camera and Viewer devices. All you have to do is to download Alfred on the devices, log in with the same Gmail, and set them as Viewer/Camera depending on your needs. Remember to log in with the same Gmail so Alfred can pair them up. Need further assistance? Go back to the list of frequently asked questions, check out the tips, start a new thread, or fill out the issue report form! ¿Puedo tener varias cámaras en la misma cuenta? ¡Sí! Alfred es compatible con un número ilimitado de cámaras y dispositivos de visualización. Puedes configurar tantas cámaras como necesites. Kann ich in einem Konto mehrere Kameras haben? Ja! Alfred unterstützt Kamera- und Viewer-Geräte in unbegrenzter Zahl. Sie können so viele Kameras einrichten, wie sie benötigen. Posso ter mais de uma câmera sob uma única conta? Sim! O Alfred suporta um número ilimitado de câmeras e dispositivos de visualização. Você pode configurar quantas câmeras precisar. 하나의 계정에 여러 대의 카메라가 지원되나요? 예! Alfred는 무제한의 카메라와 뷰어 기기를 지원합니다. 원하는 만큼 많이 카메라를 설치할 수 있습니다. Могу ли я иметь несколько камер в одной учетной записи? Да! Alfred поддерживает неограниченное количество камер и отслеживающих устройств. Вы можете установить столько камер, сколько вам нужно. Como faço pra colocar mais de uma câmera? 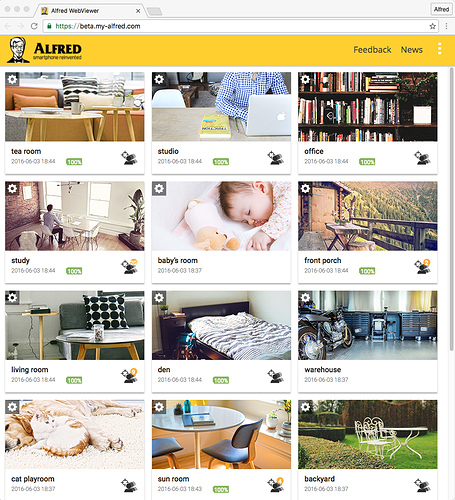 Please just download Alfred to all the devices, log in with the SAME Gmail, and select them as “Camera.” You will be able to see them on your Viewer device! Hope this helps! If you have more questions, please do not hesitate to let me know! Do you still have this problem? It seems like your Camera’s battery died at that time. Could you make sure your Camera devices are plugged in from now on? This will ensure continuous surveillance! What about Error code 1016?? If you have more than one Viewer, use Alfred’s WebViewer, or have someone in your Trust Circle, please make sure all live-viewing sessions have been terminated on other devices before starting one with your current device.